Dentology – Dentology is a branch of auto body repair, dealing with the removal of minor pressure blemishes to metal, through a scientific method, commonly referred to as paintless dent repair. It deals with but is not limited to, the process of restructuring metal on a vehicle to its original state, after a minor impact or push. Dentology primarily deals with two types of dents, perforated and protruding, with two primary causes dynamic denting and quasi-static denting; together, they contain endless subcategories and varieties. This branch defines a dent or ding as any discontinuity to a panels resistance and stiffness from its original factory setting. Which is typically created by hail damage (dynamic denting), or by structural frame resistance caused by “door slamming” to the outer shell (quasi-static denting). Dents are further defined by size factor mapping: breath, length, depth, location, metallurgical alloys, paint, structural obstructions, and environmental variations. The size factor mapping of a dent is primarily focused on the shape and form of this discontinuity.Perforated dynamic denting is by far the most common, defined as pushes from the outside in, and caused by a number of factors that a vehicle will encounter, from the outside world. Protruding dynamic denting is far more rare, at least as a stand-alone: often accompanying large dents when bracing is struck from pushing the outer shell into the bracing. That is to say, together these two types of dents create macrodynamics, which is the study of complex dented structures as it relates to dentology and microdynamics, which deals with simple dented structures. Microdynamics deals with the most basic shapes encountered within dentology: namely, triangles and circles. Since triangle dents are by far the most complex of the two, lets briefly touch on their structure. The contour of the origin both laterally and diagonally is the deepest point of the origin; its caused by the shape of the object that struck the panel, in this case triangular. The path of the object which struck the panel affects the depth of the dent and angle of the strike vertically and laterally. This is important because it helps us reverse engineer the damage at least in theory. The process of reverse engineering a dent is known as reversing the origin, while the entire process of identifying the contour of the origin is called mapping the origin or simply, mapping. Either way, mapping’s entire purpose is to reverse the origin. When dealing with triangles we start with the trench. The trench or “path of the origin” of a crease is the lateral origin along its length and includes any and all damage attached along its line. The trench does not refer to the bottom of the crease as a whole, but rather the entire damage to include the teardrop or point of entry. These trenches have walls which are attached to the undamaged portion of the repair surrounding the crease. This is referred to as the bank or simply the embankment. The embankment, although relatively flat is still affected by the crease due to the displacement of metal, which we will not be covering here. Perforated and protruding creases are vertical structures defined by the origin and its relation to medial embankment angles. A crease has two separate origins. 1) the lateral origin which is the trench or lowest point that runs in the direction of the impact. 2) medial origin, which starts on one side of the trench and runs to the other high side of the trench through the origin. The vertical mean is always cut in half and creates two right angles cutting through the center of the crease. This allows us to mathematically determine the exact angle of the origin, based upon the medial origin and hypotenuse embankment. 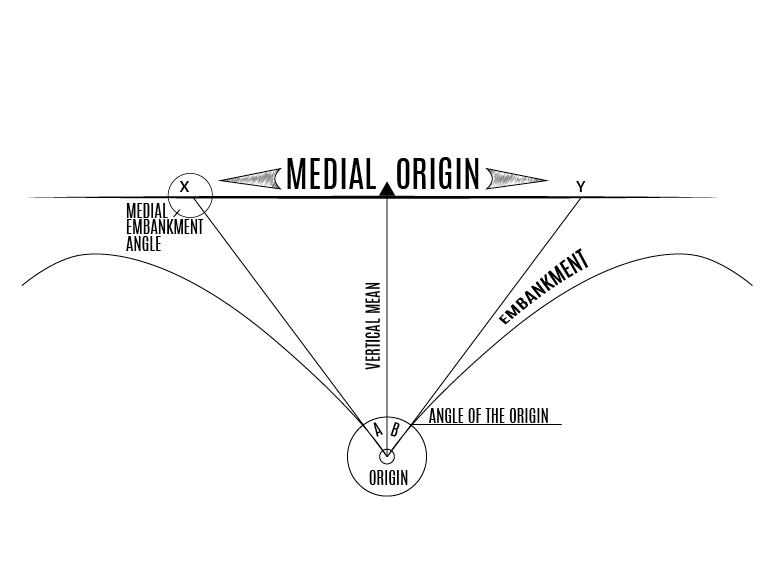 The medial origin has two medial embankment angles on each side determined by the angle of the origin, for brevity sake we call them alpha/bravo banks. As a result we can begin to define rules, such as: 1) Do not fold the embankment over the origin. 2) Always open the embankment instead of closing. 3) Make passes on the lateral origin along the path of the origin. Just to name a few.